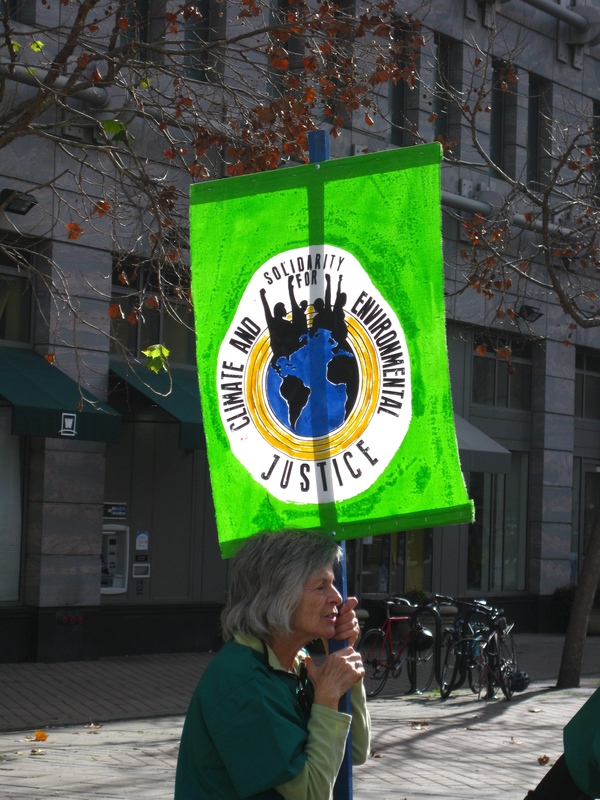 Oakland March for Real Climate Leadership. We had such a diverse and representative group on board. This bus did San Luis Obispo proud. Youngest on board Lucas 7 with his grandfather, great student presence from Cuesta lead by David Kooi and Poly lead by Jesse Gibson, and the rest were the movers and shakers in the community providing the glue and connecting the dots. 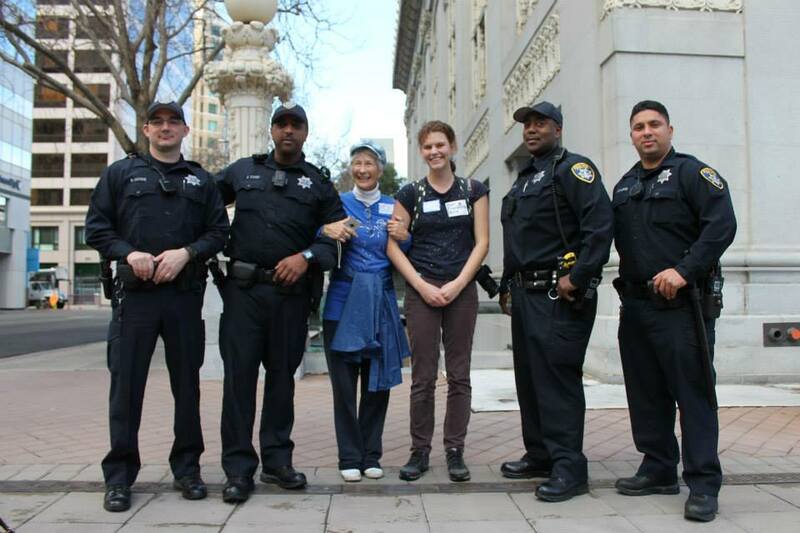 This was taken in Frank Ogawa Plaza in front of an historic heritage live oak. Its called the Jack London Oak and has quite an interesting history. http://www.asla.org/ppn/article.aspx?id=19088 Truth is I did not know Jack London grew up in Oakland. Eric Greening graced us with his presence and provided us with gems of info about the inter workings of our governing boards and made sure we didn’t miss the San Ardo oil fracking oil fields which are too close for comfort to our county line and a precursor to what is in store for us in Price canyon and Husana​ if we don’t do something straight away to prevent it. Seeing it on the way home was an eye opener. Lights from the operation reflected off the clouds and lit up the sky. It was bright. We had fresh coffee and pastries from Black Horse and Cowboy Cookies and munchies from SLO Food co-op. Tori, Linda and Holly. Take charge ladies that just made things happen. Thank you. And to our sponsors who donated seats and made sure this happened. THANK YOU. Always get just what we need when we need it. This community ROCKS. Thank you. Thank you June for handling the check ins. No small task. Never did find out where that extra person came from on the way home but at least we didn’t lose anyone. ​L​et me say that people power celebrating our love and commitment to Mother Earth generated so much good energy it put dinosaur energy to shame. Brown’s response to the March. 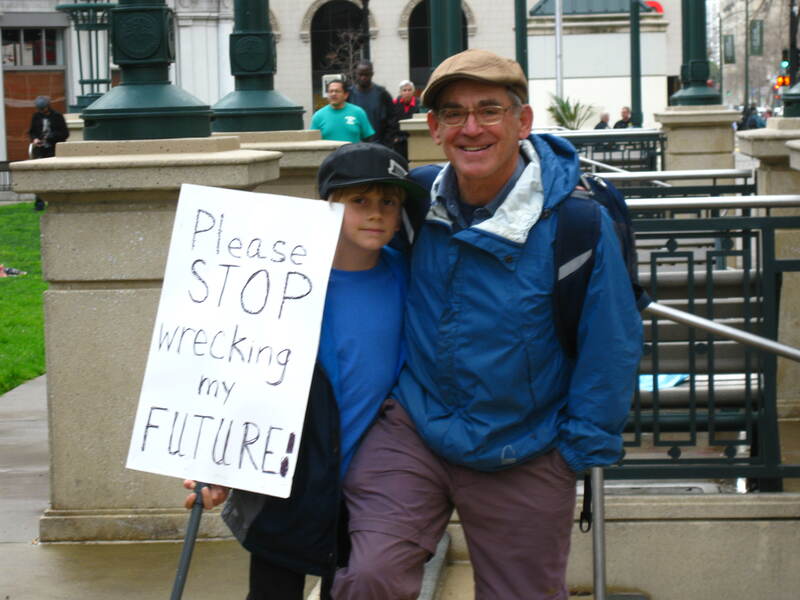 http://www.latimes.com/opinion/op-ed/la-oe-hertsgaard-jerry-brown-fracking-20150206-story.htmlToo bad, I think he is too far gone. Politics has a strange way of changing even the best people with best intentions into someone you hardly recognize. 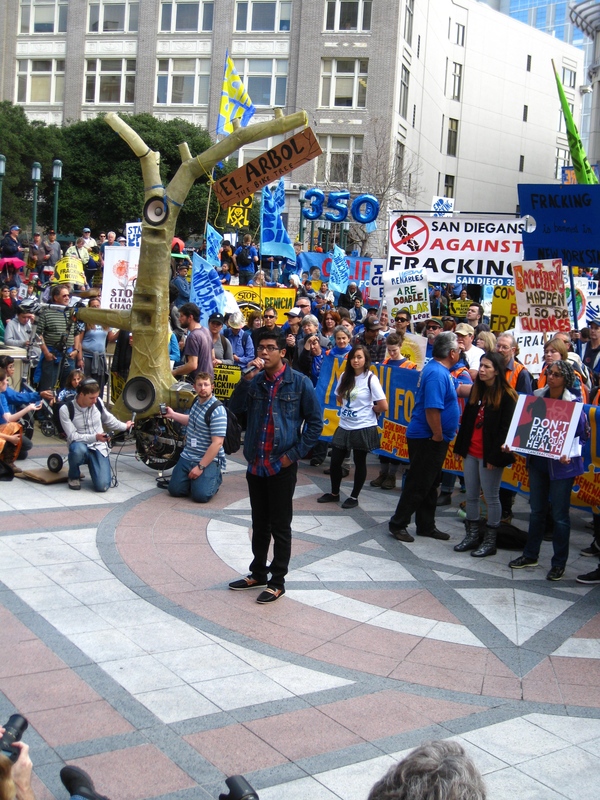 This is David Kooi on the right Cuesta College organizers for Students against Fracking with fellow student Chloe on the step of Oakland City Hall where Brown walked every day when he was Mayor. Jesse Cal Poly student against Fracking organizer. ​ 2 more States just joined the strike. Oil is creating jobs nobody wants. ​This is Alliance of Nurses for Healthy Environments. health impacts from fracking if our Board is interested. Is our Board interested? All the people here concerned about their health and safety and future generations. All taking our duty and responsibility as stewards of the earth very seriously. How can Brown not get this? Does he really trust the oil industry more than he trusts us? 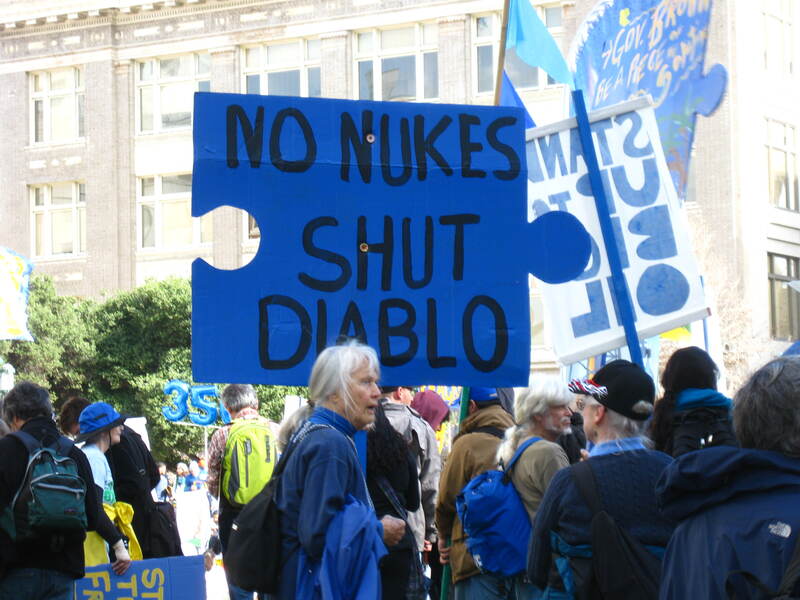 If Brown ignores this contingency, No Nukes, that he vowed to shut down on June 30, 1979 then he is choosing to break his promise. He knows the right thing to do. And he has the power to do it. He has the power to Shut down Diablo. to keep California a Safe and Beautiful place for generations to come. It is called the power of the pen. We give him permission to use that power now. The officers were standing in a group looking very isolated. I asked them if there would be escorting us down main street and they said yes. I asked if they would mind if we took a picture with them and they were most accommodating. Chloe is on my right and this was her first march. I don’t think it will be here last. I thanked them and I think they appreciated being recognized. Really who doesn’t? It was a good day. The convergence after the Rally was so amazing. 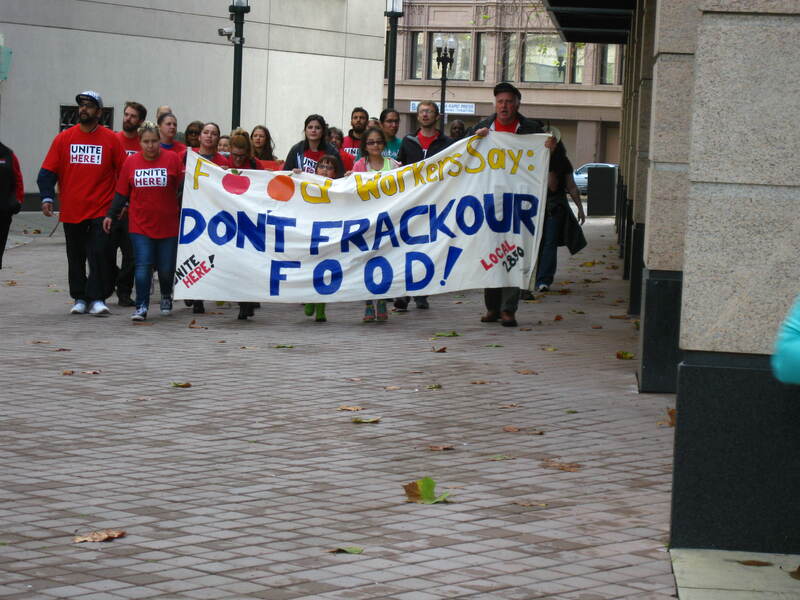 We heard first hand info from the organizers on how they got Cuomo to sign a ban on Fracking in New York. Local actions were key. An amazing attorney, Madeline Stano, Center on Race, Poverty and the Environment talked about strategies and how the oil companies think. She is currently working with the locals in Kern county who have had they water poisoned, air polluted and rigs built within a hundred feet of schools and residences. It is a nasty ugly situation. I talked to her after and she graciously agreed to look over a draft for an ordinance we are working on in SLO. David Brawn who was part of the New York to ban fracking campaign loves SLO and is anxious to help us with our campaign.Neighboring communities, Santa Barbara, Monterey, San Diego, Butte, are all about helping each other out. We are all in this together. ​And here is a very nice synopsis of the trip by Marty Brown. The morning was dark and rainy. Participators from North County met the bus to Oakland at 6:45 a.m.
We joined people from San Luis Obispo and our coordinator and spokesperson, Jeanne Blackwell, an energetic and energizing leader. have been physically and psychologically damaged by oil drilling — some located very close to schools and homes. The trip was rainy all the way – skies dark. When we arrived in downtown Oakland, there was a clearing and the sun shown. The buses arrived from as far south as San Diego and as far north as Humboldt. There was mutual respect between the police and demonstrators. Along the march route we passed many spectators who were aligned with us. People in tall apartment and hotel buildings cheered us on. There was only one anti-anti fracking and climate change denier demonstration held by maybe five men with signs saying “Climate Change is a Lie”. 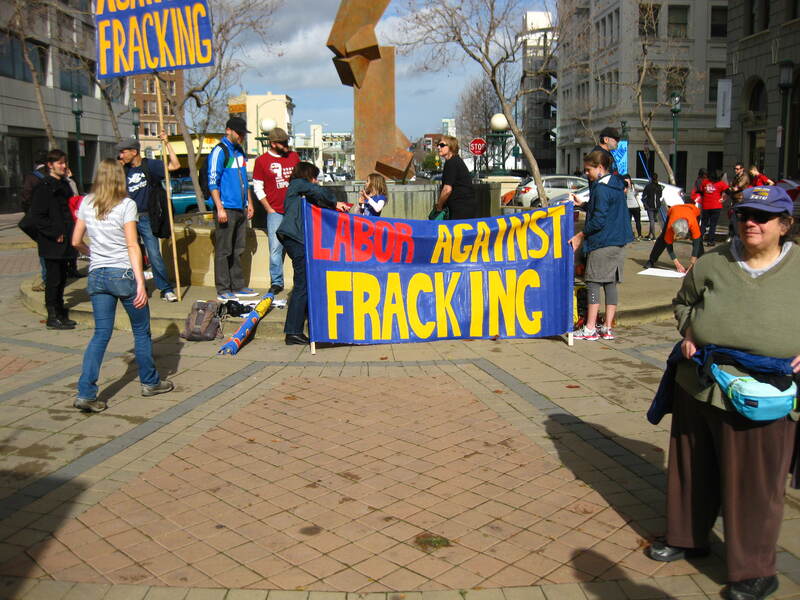 affected by fracking that is already taking place. I felt there was no place I’d rather be than there at that time with 8,000 Californians who say NO! to fracking and want real climate change action by those we have trusted with our future. It was encouraging to be outnumbered or at least matched by young people — it was not a grey-haired convention as it often is. Students from Cal Poly, Cuesta College and UCSD, Humboldt State, UCSB and others were marching with us and had such energy and optimism. Alternative, sustainable energy technology was widely discussed. There is no reason to keep polluting our Mother Earth. One of the speakers from the Catskills Citizens who were the driving force behind having Governor Cuomo signing onto the ban in New York State said education is a big factor in getting climate action, and doing the research, telling the truth, using the science. 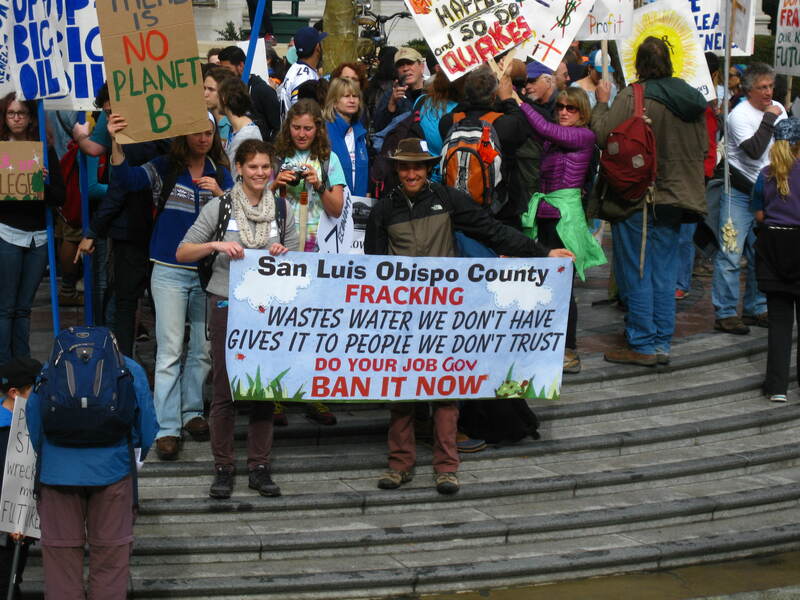 This entry was posted in Newsletter, San Luis Obispo County, SLO against Fracking, Updates and tagged Oakland march. Bookmark the permalink.